What would summer be without the traditional barbecue? Alastair Hendy reels in a deliciously different way to serve fish at a barbecue When the weather's balmy, we all love to eat good food in the garden and chat with friends. The secret of a good barbecue, however, is to do one thing well, rather than feeling obliged to serve your guests lots of different options. The flavour of this salmon dish is inspired by the ingredients used to cure pastrami. 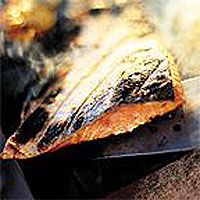 Salmon loves salt - it brings out the flavour and firms up the flesh - and when barbecued or seared until blackened on both sides, the flavours are intensified. If you want to inject loads of flavour, plan well ahead and leave the spices and herbs on for a day or two. If you're shopping for salmon today, to serve today, it can still be done - just try to give it 2-4 hours alone with the rub. You can choose to either cook the salmon whole, in half or in cut portions. If you are going to cook the salmon whole, trap it inside a grill cage, so you can turn it without breaking it up. Mix together the salt, sugar, dill, spices and powders, and rub over both sides of the salmon. Wrap in clingfilm, put in a shallow long dish or on a tray, weight (with a chopping board) and chill for at least 4 hours and up to 2 days. Put the lemons, flesh side down, to grill on one side of the barbecue. Remove the salmon from its clingfilm wrap, rub with the olive oil, and grill near the coals. For the fillets, cook for about 3 minutes, skin side down. Carefully turn over and grill for a further 2 minutes. For the whole side cook for 5 minutes, skin side down. Turn and cook for a further 3 minutes. If you prefer salmon well done, leave it to cook a minute or two longer on both sides until the flesh flakes. Scrape the fish slice along the grill rack under the salmon to loosen, and remove to a serving dish. Dress the rocket with the olive oil and serve with the grilled lemons and salmon. A potato salad of waxy Jersey royals or some barbecue-grilled bread is all that you need to go with it.